So, for all non-Germans out there: “Fleischkammer” translates, literally, to Fleshchamber. Does not bode well, now, does it? The complex works best, logic-wise, near a sufficient accumulation of raw material, read: victims, for it is the home of one thoroughly nasty man named Hakkar Wolkennen, also lovingly known by his soubriquet “Soulflayer”. The mad wizard is obsessed with the creation of, you guessed it, flesh golems and thus, one of the first obstacles will be for the PCs to dismantle to entry doors to the proper complex, for a flesh golem is holding them barred. Big plus: The mechanics of 5e are taken into account in a proper contest here. The complex itself is sensible and features some nasty traps to further deal with the PCs if the golems and the evil wizard do not suffice. As a minor complaint, the latter is not hyperlinked and making a wizard of this level on the fly can be a bit of a challenge. The complex does reward the PCs appropriately for braving its challenges, though. 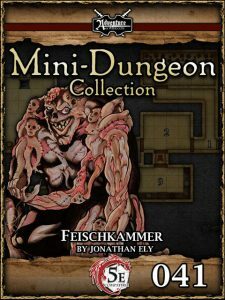 Jonathan Ely’s Fleischkammer is a generally well-crafted module that, much like the primary antagonists herein, can be summed up as brawn over brains; the nature of the opposition does mean that magic-users won’t have much to do herein, which is perhaps the one weakness of an otherwise nice mini-dungeon. Having something for these guys to do in the respective combats would have been helpful. That being said, apart from these minor complaints, one can still consider this to be a nice module, particularly to “reward” the group’s melee-characters. Kyle Crider’s conversion of the module is generally well done as well and manages to translate the module properly to 5E, retaining its pretty brutal original challenge. As such, this sidetrek receives a final verdict of 3.5 stars, rounded up due to in dubio pro reo.